One of the most rewarding parts of fieldwork on volcanoes is when the parts start to fit together, and hunches turn into firmer ideas. When piecing together ancient volcanic eruptions, the process often starts with the discovery of the trace of a new deposit in a road cut section. This might be something as simple as the appearance of a scruffy yellow or orange band that catches our eye as we pass by (as, for example, in the photo below from an earlier blog post). Karen Fontijn and Harriet Rawson measure up an ancient pumice deposit – the orange layer – in a road cut. A quick clean up of the surface with a trowel , and running the sample through your fingers, is usually enough to tell whether this really is a pumice deposit – and then the hunt is on. Where did it come from? How big was the eruption? How old is the deposit? Where does it fit into the record of eruptions we already know about? We can usually get fairly good answers to most of these questions from the field, but to understand why we need to know a little bit about pumice. Everybody knows what pumice is: it’s that frothy rock that floats on water, and many people might even have a small lump of it in a corner of their bathroom. But to the volcanologist, pumice is the grail: a gobbet of magma, frozen in mid-flight that captures in its essence the story of the eruption: where the molten rock came from, how it matured before the eruption began, and perhaps even how the eruption started. A block of pumice. 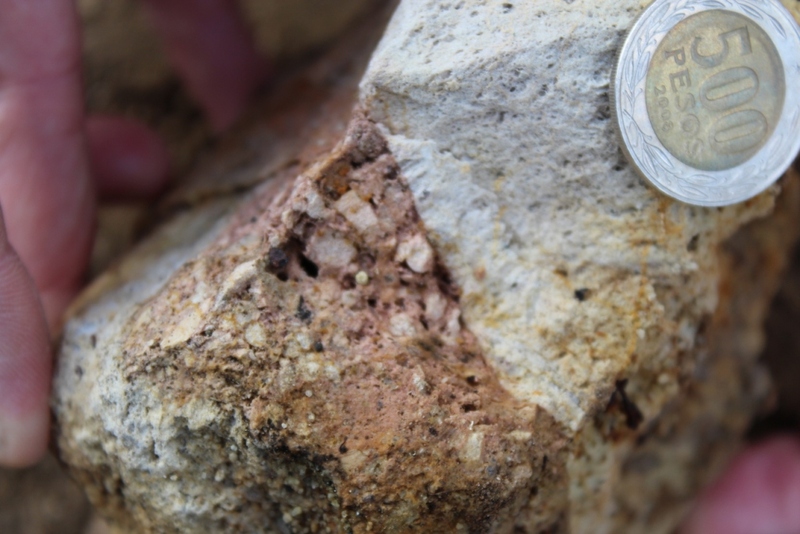 This pumice sample had a chequered history even before it was erupted. It broke apart, and then welded back together, as it rose up through the volcanic conduit towards the surface. The break separates the pink from the white areas. Coin is about 3 cm across. Most explosive eruptions produce pumice, and it is this that gets carried high up into the atmosphere in the eruption plume and blown by the atmospheric winds, before raining down onto the surface below to form a pumice fall deposit. 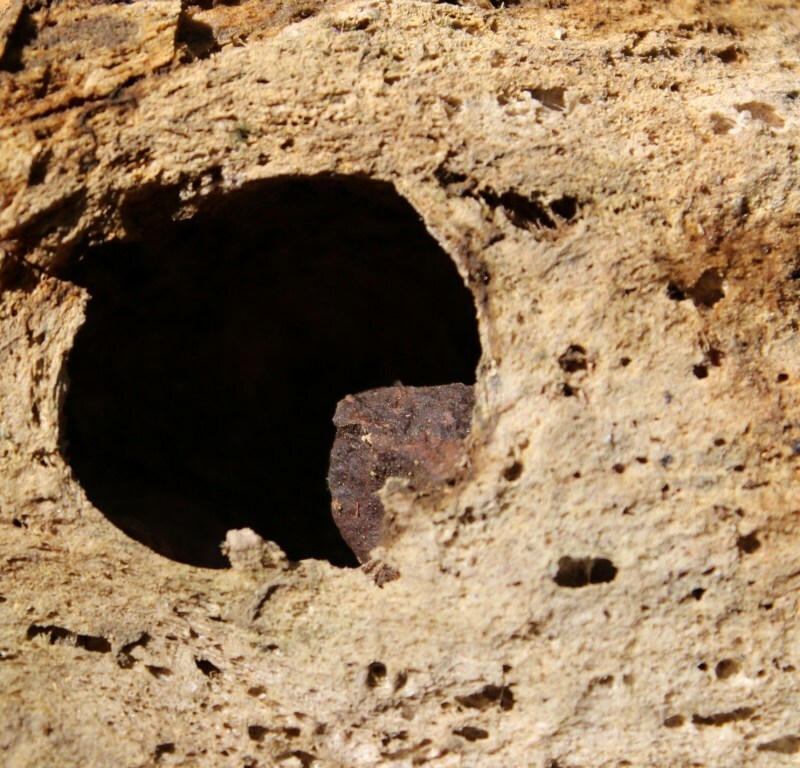 These sorts of deposit are remarkably similar from volcano to volcano the world over. Typically, they are made up of angular fragments of white, cream, yellow or grey pumice that just pile on top of each other where they fell. 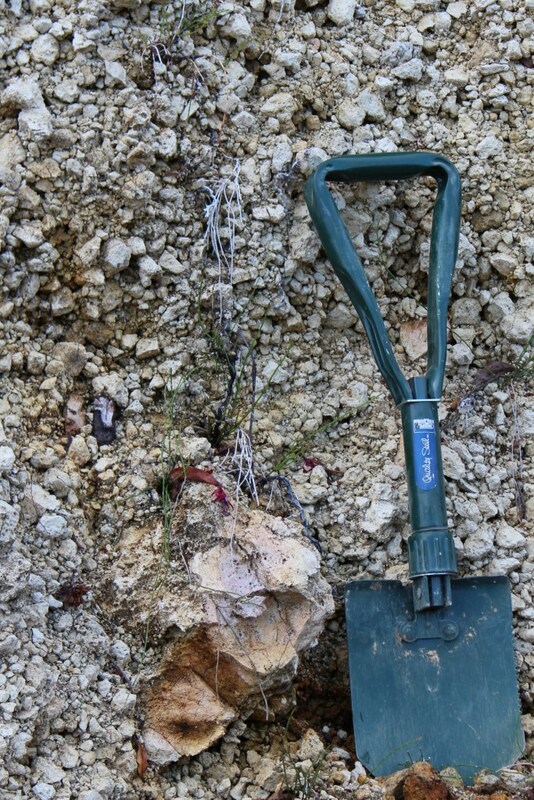 Pumice blocks can range in size up to about 20 – 30 cm across, but are more usually centimetre to millimetre sized. And because these deposits are formed from strong eruption plumes – similar to that described by Pliny the Younger at Vesuvius in AD 79 – the pumice deposit covers the landscape like a carpet, gradually getting thinner and finer away from the volcano. We can use these changes in thickness and fragment size to work out the size and strength of the eruption; and we can also use the map of the deposit to work out not only where the eruption began, but also the wind direction at the time. Large bubble in a pumice block, formed as several smaller bubbles coalesced. Bubble is about 3 cm across. or whether it is the droplet of once-hot basalt magma that might have stirred up the eruption in the first place. Frozen droplet of dark-grey basalt, on the edge of a large gas bubble, trapped within a larger block of cream coloured rhyolite pumice. Did the arrival of some hot basalt into the rhyolite magma chamber cause the eruption? Bubble is 2 cm across. 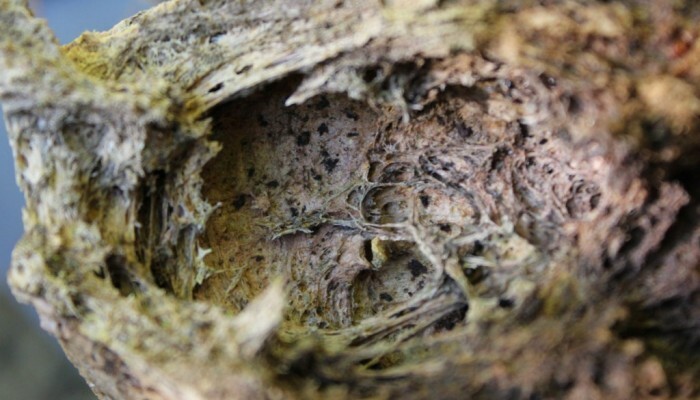 The clues to both why an eruption happened, and its consequences at the time, can all be extracted from the buried remains of that ancient carpet of pumice. After a day of successful pumice-hunting in the field here in Chile, we have returned to base camp (well, it’s actually a very well appointed wooden cabin) laden with samples, and many more questions to think about. Beware of the sealions (‘cuidado lobos marinos’) declares the sign at Valdivia fish market, which stretches along the docks in this southern Chilean city. And it’s no joke either, as a large clan of these creatures has set up stall in the estuary beneath the fish market, ready to feast on the daily pickings cast over the sea rail. We are not here, however, to admire the sealife; or to see how the city has recovered from the devastation of past earthquakes. 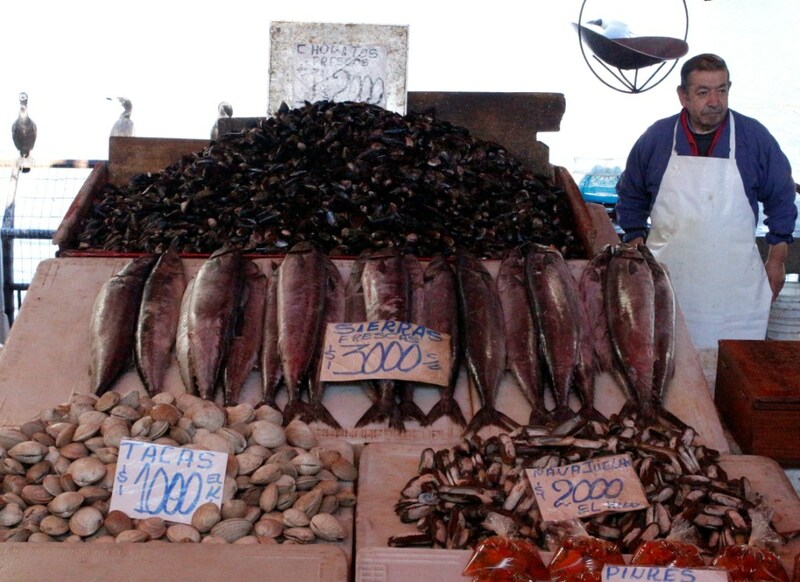 Instead, Valdivia is our gateway to the volcanoes of southern Chile; the chain of snow-capped mountains that adorn the landscape for over a thousand kilometers south from Santiago, like a trail of giant milk chocolate Hershey’s kisses. For the past few years, we have been piecing together the trace of past eruptions from some of these volcanoes by scouring the landscape for layers of ash and pumice deposited long ago, and now buried deep in the soil. This time, the target is Mocho Choshuenco, a twin-peaked volcano that looms majestically over lakes Panguipulli and Rinihue. Volcan Mocho Choshuenco, Chile. Choshuenco, to the left, is probably no longer active. Mocho, to the right, last erupted in 1864. Mocho, the younger part of the volcano, is last known to have erupted in 1864 and has shown no signs of activity since. This is not at all unusual for these volcanoes –which have lifetimes of hundreds of thousands of years, and where the intervals between eruptions can often stretch from decades to centuries. But it is the past activity of Mocho that we are looking for. 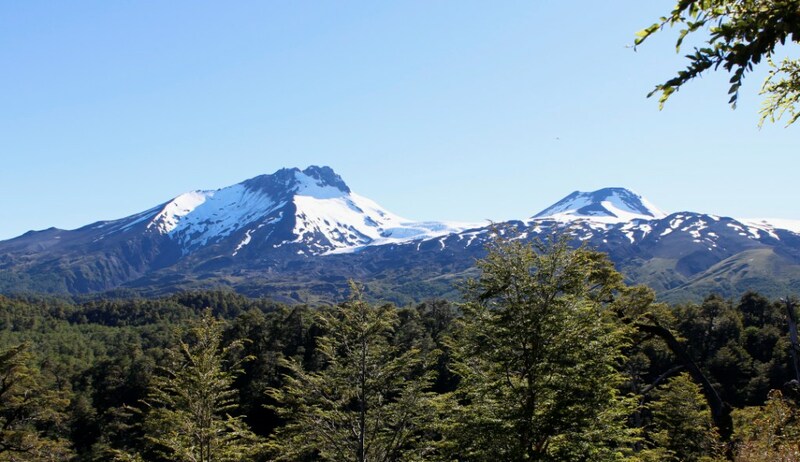 Earlier work by colleagues from the Chilean geological survey suggests that there may have been two or three ‘large’ eruptions in the past 10,000 years, as well as numerous, undocumented smaller events. 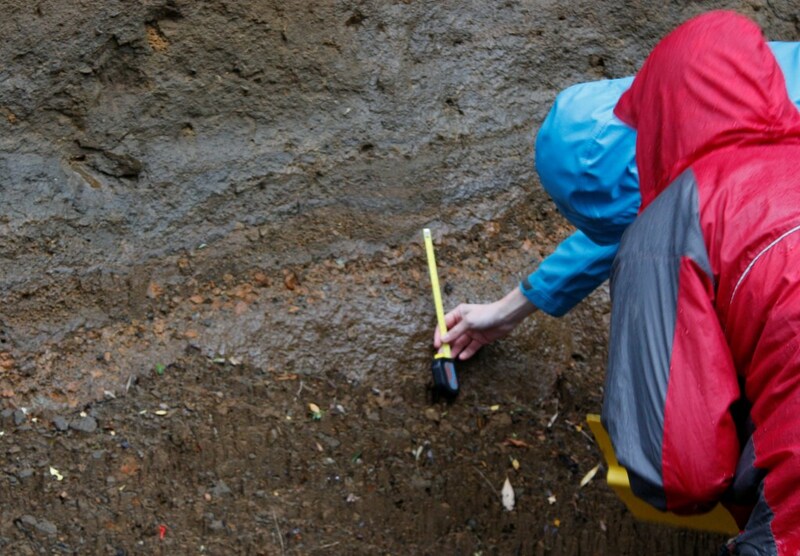 We plan to track down the deposits of these eruptions wherever we can find them – and this usually means buried deep within the rich soils of the temperate rain forests of the region. Rather than excavating pits ourselves, we rely either on nature (erosion) or human activity to expose the pumice in road-side cuttings. A little bit like the sealions, perhaps, reliant on the pickings of the day. This is only the first step in the detective work, because to identify which eruption the pumice has come from we need to collect samples for chemical analysis. In southern Chile, this is easier said than done – as the several metres of rain annually, and the warm summer temperatures, leave ten thousand year old pumices with the consistency of warm butter. Over the next few days of this field season, we will be completing the first stages of this work, and starting to put together a time-line of the past eruptions for which we can find a trace. Today sees the launch of a project that I have been working on for the past few months – with the release of a short YouTube animation which explores processes in subduction zones. This is a part of a larger-scale public engagement activity called OxfordSparks which has been coming together over the past eighteen months. This project has brought together a great creative team from across Oxford (with experience ranging from crowd-sourced science, life-long learning, outreach and education to script writing, sound production and digital media), linked by a common interest in public engagement with science. From the outset, the aim of the project was to use short YouTube animations to draw people in to find out a bit more about topics in science. These short films are intentionally quirky, animated brilliantly by a science graduate and professional illustrator, Karen Cheung, and designed to stand alone. From the outset, we thought quite hard about how to make a series of science animations that were on the one hand entertaining, and on the other hand educational; on the one hand, having some visual elements that linked the animations to each other, while on the other, being able to seen as a ‘stand alone’ video that is not labelled as ‘Science’. At the same time, we needed to be able to cover the scales of length and time that might be encountered across a wide spectrum of science topics. Whether we have succeeded remains to be seen, but and our solution was to have an innocent bystander, a green ‘popsicle‘ called Ossie, who would stagger haplessly into the experiment of the day. So far, Ossie has been shrunk to the size of a proton and accelerated to close to the speed of light in the Large Hadron Collider; taken a trip towards absolute zero through interstellar space; and investigated the genetic basis of hypertrophic cardiomyopathy (a common cause of sudden cardiac death in the young) and the workings of the human heart. For the volcano animation, I wanted to follow the pathways of water molecules in subduction zones: from mineral transformations in the down-going slab, through dehydration and release from the slab at depth, to the control on melting within the mantle wedge and concluding with a mildly explosive eruption. The location for the scenario also took a little thought. 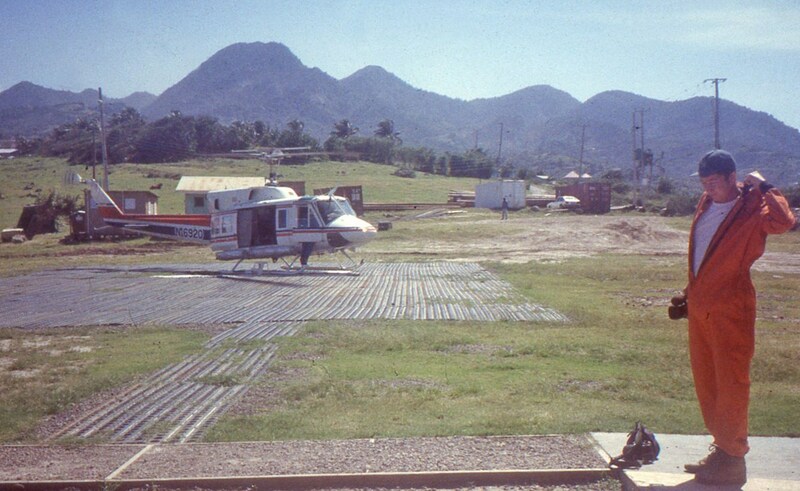 We wanted somewhere that is perenially active (to avoid the sensitivities of locating it somewhere that might not be active); and at the same time, we wanted a region where there has been enough work completed so that the nature of the subduction zone and the structure of the volcano plumbing system are fairly well known. Stromboli fits the bill really very nicely: it has been very well studied, and continues to be very closely monitored; and the Calabrian arc, although not typical in some respects (for example, the rapid rate of roll back or retreat of the subduction hinge; and the very old nature of the subducting oceanic crust), has nonetheless been very well characterised. Coupling that with some recent ideas for the way that serpentinisation might be enhanced near the trench due to bending of the slab, and with some visual impressions of how melt moves in the mantle, and we were ready to go. Ewan Kilgour quickly came up with a script that managed to convey the essential science within an entertaining storyline, and Karen Cheung provided the visual interpretation of the script, which was completed late last week. The soundtrack was laid over the past weekend by John Halliday, along with a narration by Ed Byrne, whose love of volcanoes was recently revealed on BBC’s ‘volcano live‘. In due course, we will release a set of teaching exercises appropriate for a range of age groups to go with the animation; but the for the time-being viewers will have to be content with a short list of links to a range of resources on volcanoes. Enjoy – and do let us know what you think of it! Last week, the UK’s Natural Environment Research Council (NERC) launched an over-arching programme in Natural Hazards, a network called PURE (Probability, Uncertainty and Risk in the Environment). This post is a very short attempt to navigate the maze of acronyms of projects that are either linked to PURE, or to other related initiatives in Natural Hazards in the UK. PURE itself is a network, with funding for four years to support a range of activities in the natural hazards, mainly directed towards knowledge exchange and engagement with industry and policy-makers. PURE includes elements of the RCUK (Research Councils UK) Knowledge Transfer Networks in Financial Services (FSKTN) and Industrial Mathematics (IMKTN). PURE also includes two major research consortia: RACER (Robust Assessment and Communication of Environmental Risk) and CREDIBLE (Consortium on Risk in the Environment: Diagnostics, Integration, Benchmarking, Learning and Elicitation), neither of which has a website as yet, but I’ll link to those when they are up. The remit of PURE spans the spectrum of (physical) natural hazards ( including floods, extreme weather, tsunami, earthquakes and volcanic activity), while mainly focussing on UK or European case studies. PURE intersects with another set of large-scale activities which have been jointly funded by the NERC and the Economic and Social Research Council (ESRC), under a programme called Increasing Resilience to Natural Hazards (IRNH). Most of the investment under this programme will be going into two international multi-partner consortia. Earthquakes without Frontiers (EwF) focusses on improving resilience in earthquake-prone regions of the Alpine-Himalayan mountain belt; while STREVA (Strengthening Resilience in Volcanic Areas) is a partnership with volcano observatories and other agencies in the Caribbean, Ecuador and Colombia. 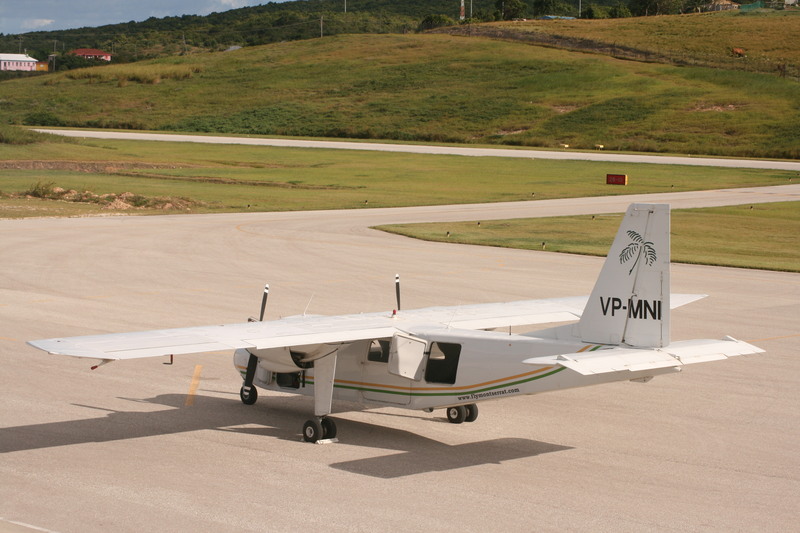 I wrote a little about STREVA‘s kick-off meeting on Montserrat in an earlier post. Both EwF and STREVA will shortly be supported by the appointment of two Knowledge Exchange Fellows, whose remits are likely to include bridging the gap between science and policy in natural hazards and risk both overseas, and in the UK. The call for KE Fellows is open until 12 February 2013. Got that? Do let me know if I have missed anything, and I shall update the post. Santiaguito Volcano: Ninety Years and Counting. Santiaguito volcano, Guatemala, burst into life in 1922 and is now the second longest continuing eruption. It has outlasted both Stromboli (Italy) and Sangay (Ecuador), both erupting since 1934, and is only outdone by Yasur (Vanuatu), which has been erupting at least since 1774, when first visited by Captain Cook. These long-lived eruptions give us an unusual opportunity to use the slowly-extruded products to peer deep into the magma plumbing system. Santiaguito itself is now a rubbly complex of blocky lavas and domes that nestle in the crater formed by the explosive destruction of Santa Maria volcano, Guatemala, in 1902, in one of the largest eruptions of the last century. After a violent beginning, Santiaguito has grown slowly (rather less than 1 cubic metre of lava/second) and in pulses for the past 90 years. Bill Rose, who has worked on Santiaguito since the early 1970’s, has documented this history very nicely. 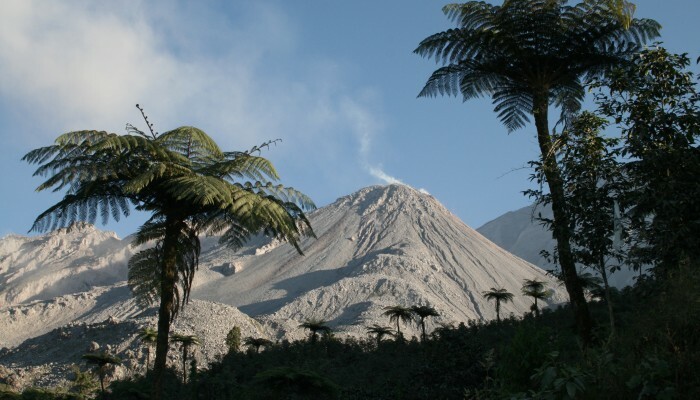 For many years, Santiaguito has been a magnet for geophysical and remote-sensing field campaigns, both because of its rather regular ash and gas explosions, and the fact that it is relatively accessible and very closely monitored by INSIVUMEH. Rather less obligingly, though, the volcano is often cloud-bound by mid-morning, at least during the dry season, when moist westerly winds roll in from the Pacific. Explanatory poster, showing the fuming dome of Santiaguito sitting in the scar of the 1902 eruption crater, Santa Maria. 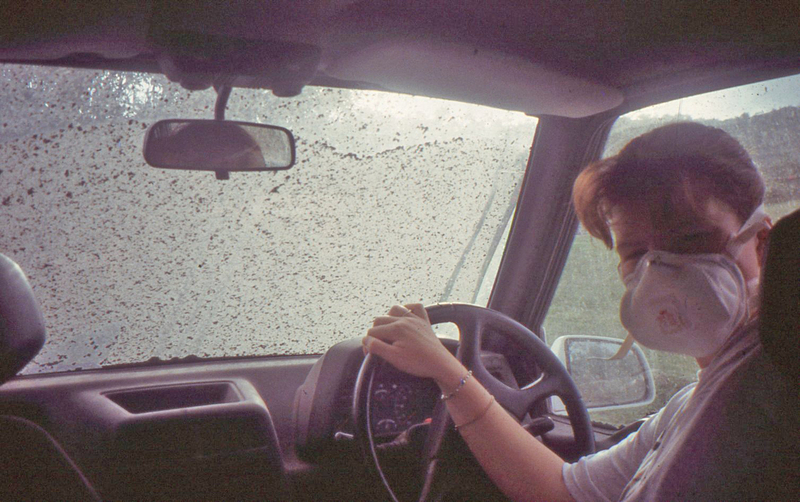 While Santiaguito has only a very slow growth rate, at the lower end of what is typical of actively-extruding domes, it poses major hazards to a number of local communities. Lahars are common in the rainy season, and transport the accumulated loose talus from the flanks of the domes downstream, intermittently causing severe damage. 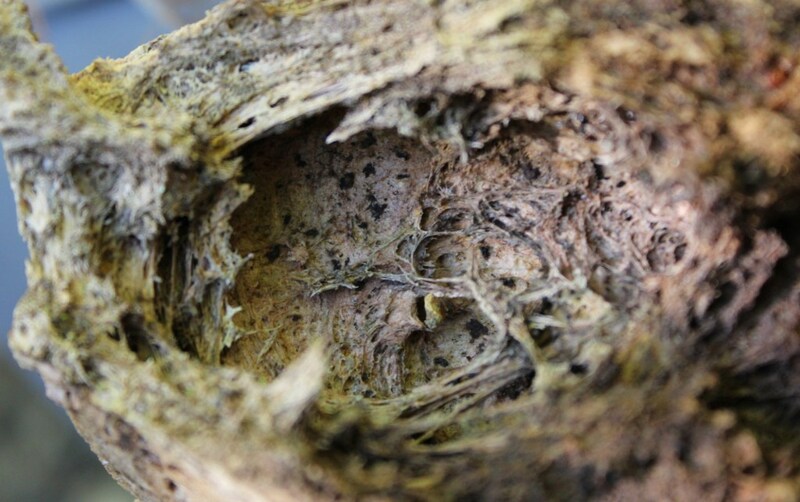 Ash deposition can cause disruption to a wider community, extending both to the Fincas and cloud-forest coffee plantations or, more rarely, to agricultural and urban centres further afield, such as Xela (Quetzaltenango). This way please.. coffee-bean receptor at Finca el Faro, on the flanks of Santa Maria volcano, Guatemala. Receny years have seen several episodes of elevated activity at the volcano, and in this past week, Santiaguito has experienced another such phase. 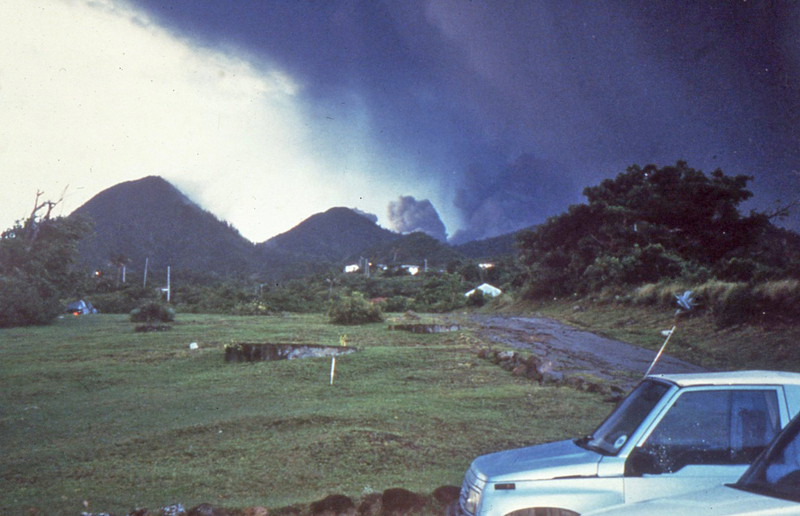 As reports from CONRED make clear, this elevated activity culminated in a large-scale slope failure from the active dome, Caliente, triggering pyroclastic flows and lofting ash plumes high into the atmosphere. The rainy-season legacy of these events will most likely be more lahars, as drainages now charged with debris become unclogged and rapidly incised. Typical deeply-incised drainage channel, high up on slopes of Santiaguito, with recent ash fall on the vegetation. My own interest in Santiaguito is in the long-term story of the volcanic plumbing system recorded in the rocks that have been progressively removed from the conduit during the eruptions of the past 90 years. Jeannie Scott has recently completed a study of this for her PhD (funded by NERC), working on samples that span much of the eruption history. The remarkable feature is the surprisingly simple story that emerges. The 1902 eruption evacuated a large volume of dacite magma with a silica content of about 66 wt%. The 1922 eruption appears to have begun by emptying what was left behind of this pool of melt from 1902, and since then the volcano has been erupting increasingly silica-poor magmas, presumably tapping deeper into the plumbing system. The latest lavas analysed (from 2002) have about 62% SiO2. These observations suggest that future lavas may continue to get progressively more silica-poor; as they do so, they may also get warmer and a little less viscous, depending on conditions at depth. Unfortunately, in the process of slow extrusion, the lavas lose much of their dissolved gas, crystallise and eventually quench, so that it is quite a challenge to track back to the ‘original’ conditions under which the magmas were stored. This still leaves several unresolved puzzles: how is it that the conduit system can remain open, allowing magma to continue to leak out to the surface? And what is it that drives the long-term pulses of eruptive activity? Answers to these questions will probably emerge once we have a better understanding of the full spectrum of long-lived dome-forming eruptions at andesitic volcanoes, such as those at Soufriere Hills (Montserrat), Colima (Mexico) and Merapi (Indonesia). JAJ Scott et al., 2013, Geochemistry and evolution of the Santiaguito volcanic dome complex, Guatemala, Journal of Volcanology and Geothermal Research 252, 92-107. JAJ Scott et al., 2012, The magmatic plumbing system beneath Santiaguito volcano, Guatemala, Journal of Volcanology and Geothermal Research, 237–238, 54–68. Jeannie Scott has now written and made freely available a colour booklet describing Santiaguito volcano and its activity, and a poster summarising recent work on the volcano. Over on her Georney‘s blog, Evelyn Mervine has recently posted a nice piece with some spectacular images of columnar jointing. This seemed like a good opportunity to dust off some field photos, with some more examples of polygonal joint sets in lavas from a variety of settings, to illustrate the diversity of forms that cooling-contraction joints may take in volcanic rocks. The first example is a late Pleistocene lava flow from the Afar, Ethiopia. 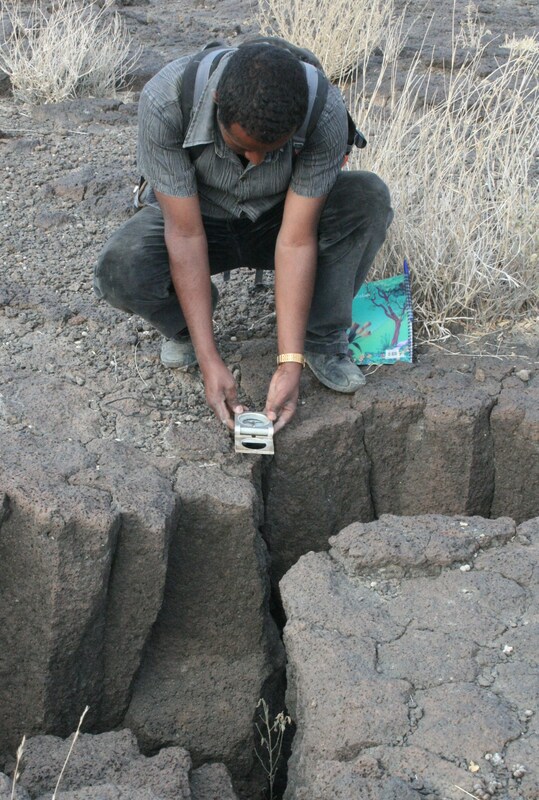 Berihu Abadi, with an example of columnar jointing in a late Pleistocene basalt, Afar, Ethiopia, exposed in the face of recently-opened fracture. Fieldwork carried out as part of the NERC-funded Afar consortium. Young lavas in the Afar are predominantly fissure-fed basalts, erupted across the topography and air-cooled. 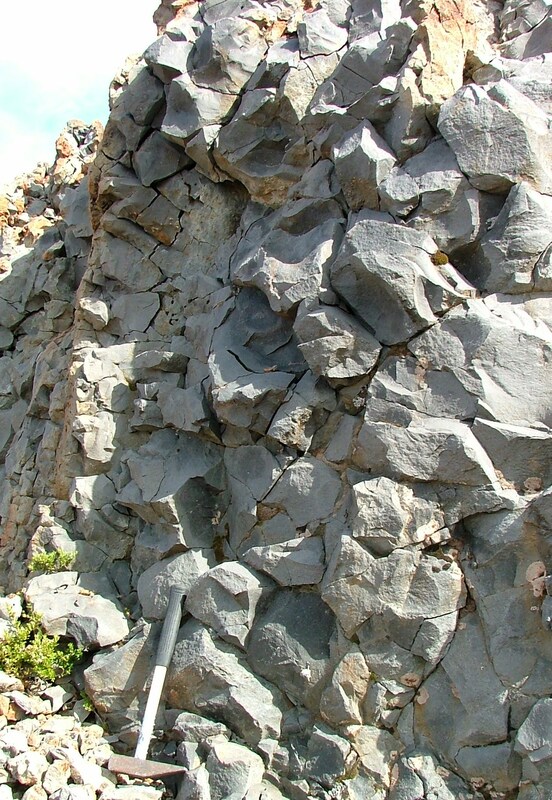 Columnar jointing is pervasive in the upper surfaces of these young lava flows, and seems to develop immediately beneath the surficial glassy and vesicular crust that forms on the top surfaces of the modern lava flows. Uppermost surface of a fresh basaltic lava flow, Afar, Ethiopia. Field of view is about 30 cm. 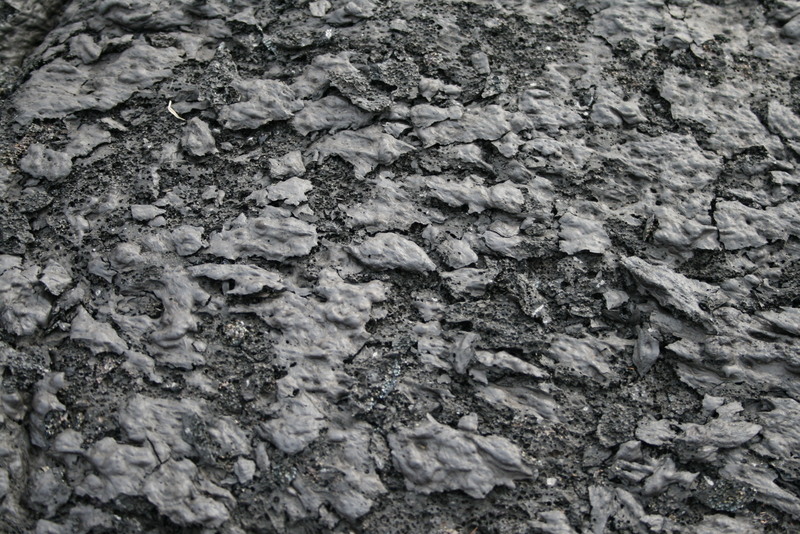 Beneath the surface layer formed by the scales of glassy, vesicular lava, the lava is weakly polygonally-jointed (not visible in this picture). Fieldwork carried out as part of the NERC-funded Afar consortium. Moving across to Europe, and southern Spain. Here, in the Cabo de Gata, there are some fabulous examples of polygonally-jointed andesitic lava domes, emplaced in a shallow submarine environment. These are Miocene in age, and formed in a transient volcanic arc, which has now been faulted against the Spanish mainland. 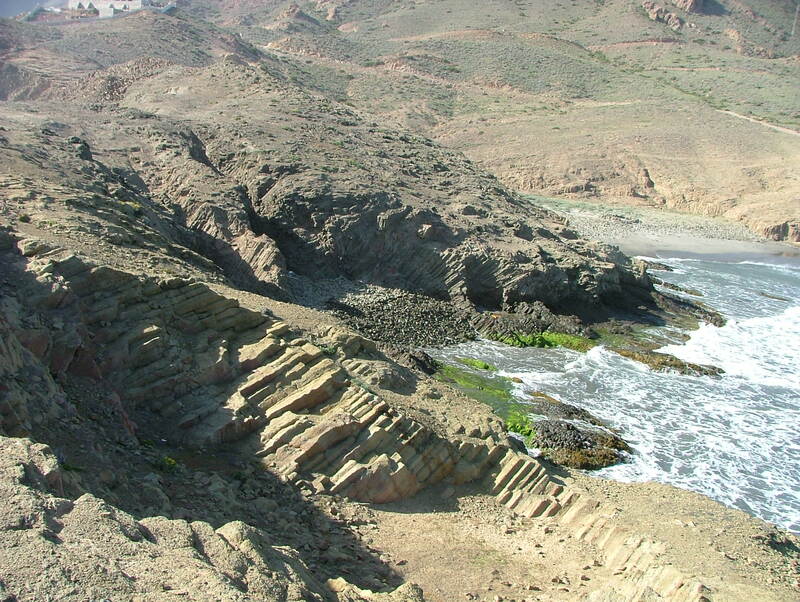 At Playa Monsul, polygonally-jointed dykes can be found criss-crossing a fabulous series of hyaloclastite bodies. Monsul is also well known as the location in Indiana Jones and the Last Crusade, where Sean Connery fends off an aerial attack with the help of an umbrella and a flock of seagulls. 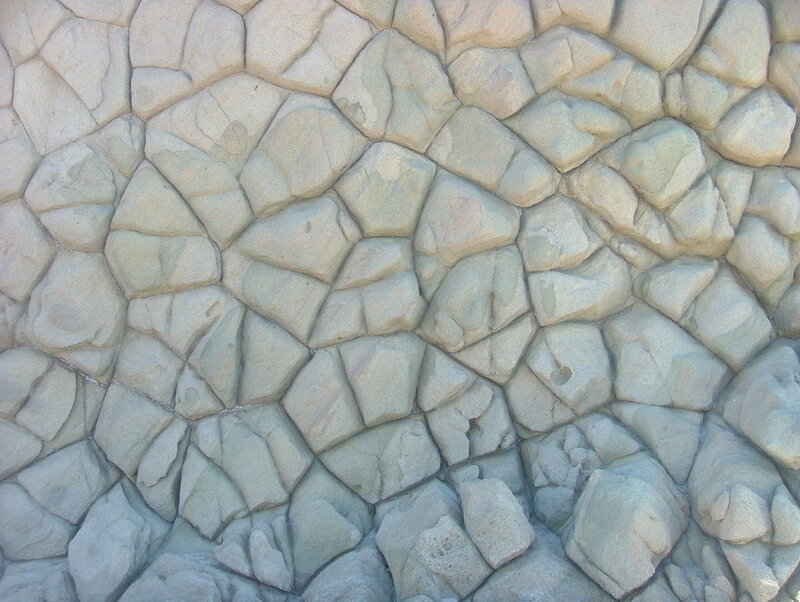 Polygonal jointing in the vertical face of a dyke, intruding a submarine sequence of wet sediment and hyaloclastite lavas. Polygons are typically 10-20 cm across. Photograph taken on a University of Oxford undergraduate field trip. 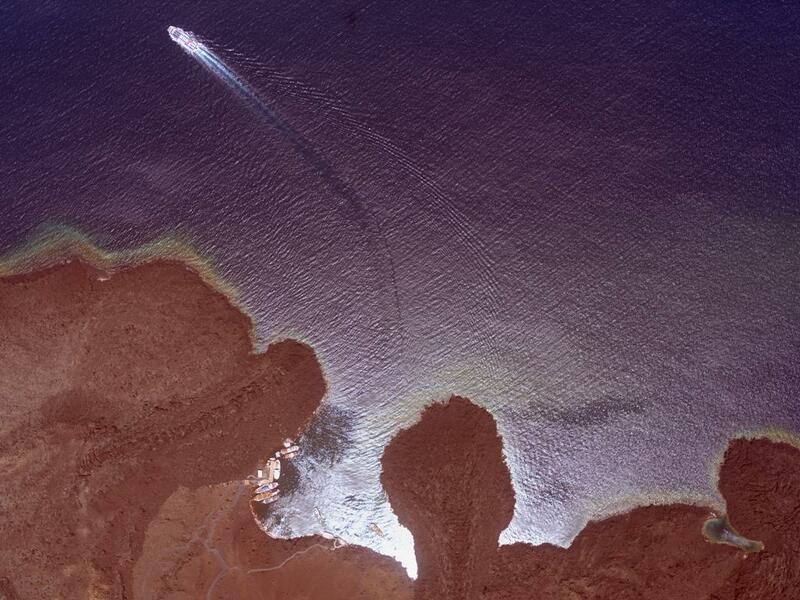 The southern-most cape of the Cabo de Gata has a wealth of collonaded andesites; presumably submarine domes. Columnar joints in an andesite ‘dome’ of Miocene age, southernmost Cabo de Gata, Spain. This locality offers some spectacular views both of polygonal joints in planform, and also large-scale structures showing the fanning of columns that reveal the orientations of the original cooling surfaces. Location visited on an undergraduate field trip. The final examples of polygonal jointing come from higher (southerly) latitudes, and higher elevations, where jointing has developed as a result of ice- or snow-contact volcanism. The first example is from the flanks of volcano Osorno, Chile, where characteristic hackly jointing has developed on the outer margins of an andesitic lava flow. This differs from the regular pattern typical of columnar jointing, and is thought to be one characteristic of rapid quenching of lava. 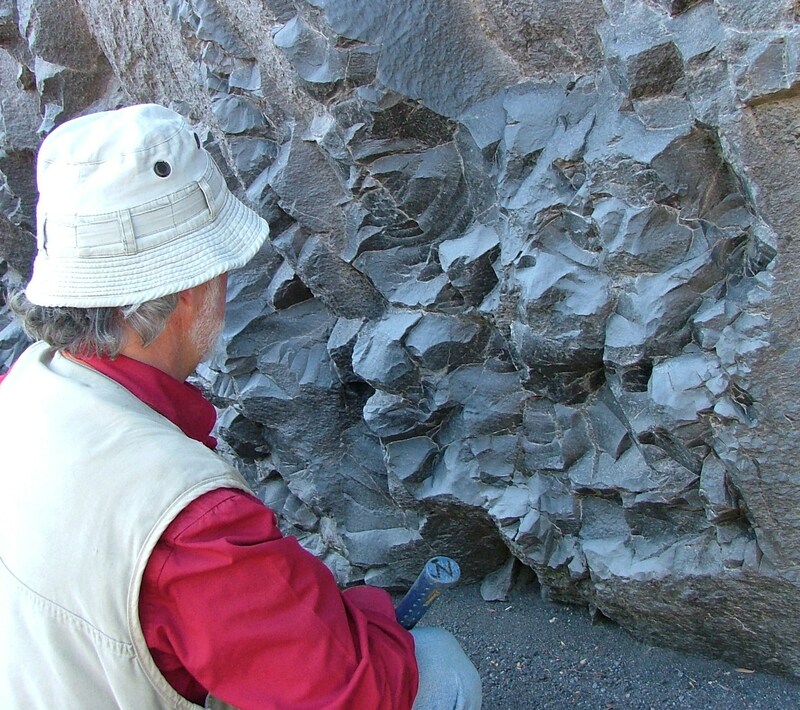 Jose Naranjo, SERNAGEOMIN, and the hackly-jointed lavas from volcan Osorno, Chile. Fieldwork carried out as part of a NERC-funded project by Sebastian Watt. A little further South, again in Chile, and here is another classic example of a small sub-glacial ridge of andesite, this time near the summit of volcan Apagado, on the Hualaihue peninsula. 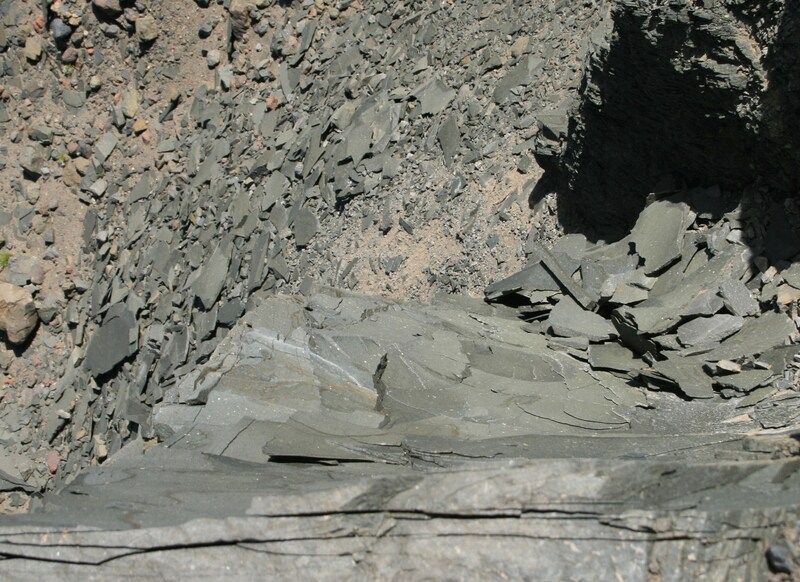 Complex polygonal jointing in a ridge of andesite, from the margins of volcan Apagado, Chile. Fieldwork carried out as a part of a NERC-funded PhD project by Sebastian Watt. 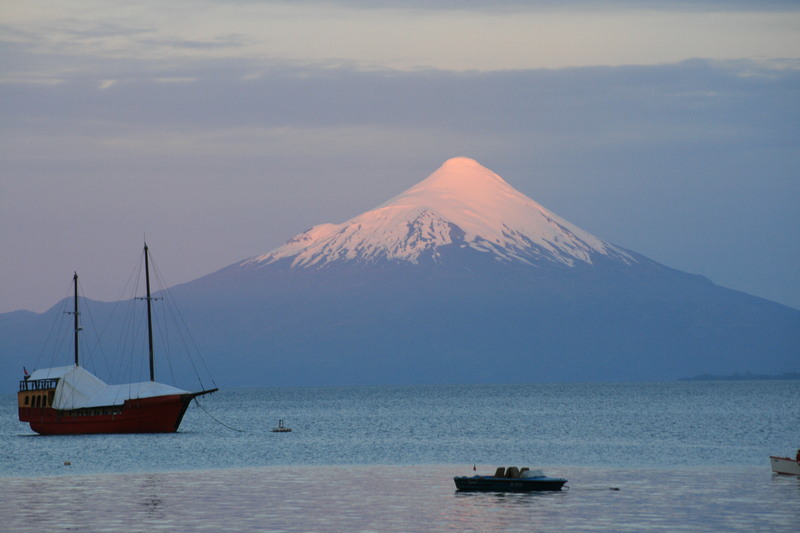 A final example is from volcan Sollipulli, a little further North in the Chilean Lake District. This example is of a dyke, thought to have intruded along the contact between a glacier and the volcanic edifice, near the present-day crater edge. Here, the portion of the dyke that was originally in contact with the ice has developed a very strong platy fabric, and is falling apart to form a scree of what looks like slate. Platy jointing developed in the margins of an originally ice-bounded dyke, volcan Sollipulli, Chile. View from above, looking down the dyke margin. Platy scree now partially fills the channel which was once filled with ice. View – about 1 m across. Fieldwork was carried out as a part of a IAVCEI-funded project on the hazards of snow-capped volcanoes. While there is general agreement that these patterns of jointing form because of the contraction of magma as it cools, there is not yet a concensus model for what it is that controls the size of the polygonal joints, or the typical number of sides. Theoretically, it is argued that a hexagonal jointing pattern would be the lowest-energy, and favoured, solution. But in reality, cooling rates might be too fast for full energy minimisation, and this might explain why many polygonal joints have fewer than six sides. This is the conclusion of the most complete study to date, in which Gyoergy Hetenyi and colleagues argue that field evidence points to two major controls being the size of the cooling body, which influences how fast it cools, and composition, which influences the physical properties of the cooling magma. November 7th marked the 175th anniversary of one of the largest earthquakes to have struck northern Patagonia. The earthquake, which is estimated to have had a magnitude of 8, had an epicentre close to Valdivia, and was accompanied by significant ground shaking and subsidence as far south as Chiloe island, and a major tsunami that reached Hawaii. The eyewitness reports of the time have been well documented. From a geological perspective, the key feature of the 1837 earthquake is that it occurred along a section of the plate boundary that has ruptured repeatedly, with great earthquakes in 1575, 1737 and, most significantly, in 1960 – which, with a magnitude of 9.5, is still the largest recorded earthquake globally. The 1837 earthquake struck just two years after the great Concepcion earthquake, of February 1835, which was exquisitely documented by Charles Darwin, among others. Because of the location, adjacent to the long southern Chilean volcanic arc, and the frequency of large earthquakes in this region, both the 1835 and 1837 earthquakes have become critical pieces of evidence for the ongoing question of whether, and how, large earthquakes might lead to small triggered volcanic eruptions. Historical records from the region that include maps, expedition reports and navigational charts mean that the record of past eruptions in the southern parts of the central valley of Chile extend back into the 16th century and the earliest Spanish colonists. 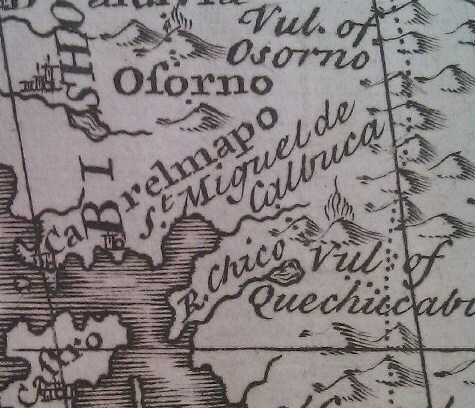 Map of southern Chile, and the northern part of Chiloe island extracted from ‘A new and accurate map of Chili, Terra Magellanica, Terra del Fuego etc.’ compiled by Emanuel Bowen in 1747. Active volcanoes of Osorno (vul. of Osorno) and, probably, Hornopiren (vul. of Quechucabi) are shown. From the Bodleian libraries, University of Oxford. The 1837 Valdivia earthquake was followed by reported eruptions, on the same date, both at volcan Osorno, and Villarrica. Both volcanoes had already been in a state of activity on and off in the months or years prior to the earthquake, and both have long historical records of activity, so the observations are not necessarily surprising. One of the challenges of testing for cause and effect when it comes to possible earthquake-triggered eruptions is the likelihood of false reporting that arises from the natural tendency of people to conflate all sorts of observations and speculations in the aftermath of major events, like earthquakes. 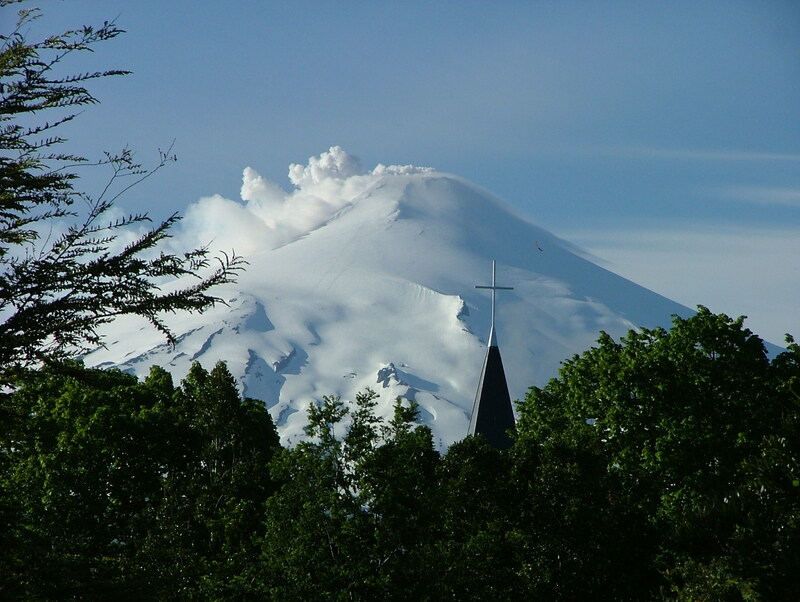 For example, both Villarrica and Osorno have also been recorded as having erupted shortly after the great earthquake of 1575, but neither observation is necessarily secure. In contrast to the reports from 1837, the 1960 earthquake did not appear to have any major consequences for either system. 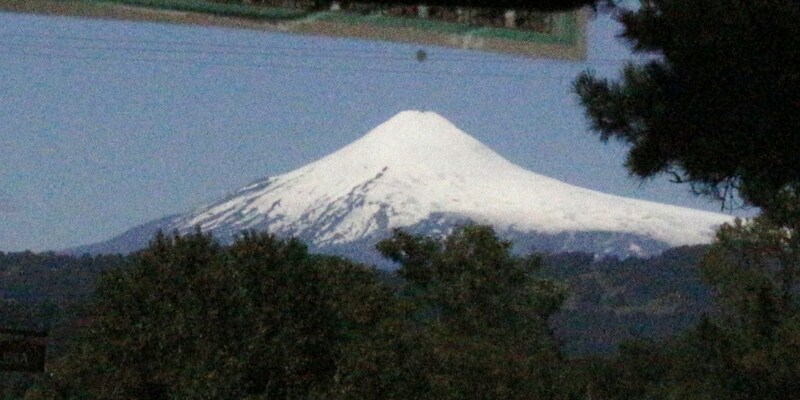 Osorno has now been dormant since the late 19th century, while activity at Villarrica has rumbled on into the 21 st century. 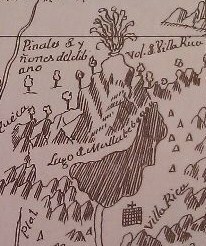 Map of volcan Villarrica, from 1759. Reproduced in ‘Cartografia hispano colonial de Chile’, published in 1952 to mark the centenary of the birth of Don Jose T Medina. From the Bodleian libraries, University of Oxford. Volcan Villarrica, with steam plume, viewed from Pucon. Work is still in progress to investigate the consequences of the most recent great earthquake in the region: the Maule earthquake of February 2010. It remains possible that reported changes in activity at Villarrica in March 2010, seen in thermal infra-red satellite imagery, and subsequent eruptions of Planchon-Peteroa and Puyehue – Cordon Caulle may ultimately be linked to the rejuvenating effects of the earthquake, but this remains to be properly tested. Of course, this is a question that is mainly of academic interest (in terms of understanding how eruptions are triggered), since most of the eruptions documented to have occurred in the immediate aftermath of great earthquakes are very small, and are most likely to occur at systems which have already been in eruption. The consequences of these eruptions are usually negligible, compared to the effects of the large earthquakes themselves. In recognition of the frequency of these potentially devastating earthquakes, the Chilean authorities (ONEMI, Oficina Nacional de Emergencia) are today holding an earthquake simulation across the schools of Santiago, as part of the programme of national preparedness for future emergencies.